Flower beds, benches, and a bird house. "Serene", "tranquil", and "beautiful" are words that come to mind when describing memorial park. The 3 acre park is immediately adjacent to, but not part of, the Venedocia cemetary just west of town. 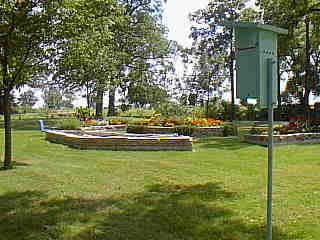 The park contains flower beds, lawn chairs, benches, bird houses, sun dials, and the war memorial. It is a place where you can sit quietly and enjoy the birds and nature and perhaps think about loved ones and ancestors buried in the adjacent cemetary. The park is owned by Salem Church and administered by a board of trustees. The War Memorial within the park contains large stones bearing the names of all community members who have seen active service on this country's wars, from the war of 1812 through the Persian Gulf war. A separate list of community members who have served in the military during peace time is also included. Of these names, those buried in the Venedocia cemetary and the nearby Horeb cemetary are marked with a special symbol. Every year on Memorial Day a service of remembrance is held at the memorial, usually with the participation of the Lincolnview High School Band. Early March winds sing through the trees overlooking Venedocia from their eternal post in the Venedocia Cemetery. The old trees also form a canopy for one of the most reflective graveyards in the county, one that is more like a memorial park than a cemetary. An old pump bed stands across the narrow drive from a historical marker commemorating Anthony Wayne's march through Van Wert County on the spot of the camp site on Aug. 4, 1794. Another historical marker commemorates the founding of the village of Venedocia. Neatly arranged bushes, benches, plaques, and flowers (in warm weather,) give an ornament of pride appearance to the site. The gently rolling drive winds into the southern part of the cemetery, which looks more like a European graveyard than anything. While this atmosphere in itself fosters the spirit for meditation of the soul the corwning glory of the old cemetery is the attractive and meaningfully contstructed war memorial. The memorial stands in the form of a semi-circle, 24 feet in diameter. At the front is a granite pulpit, four feet high, with the open bible carved in the top. Behind the pulpit, at the outer rim of the semicircle, are five granite pillars. The names of the veterns of the Civil War, the Spanish-American War, World War I, World War II, the Korean War, and the Vietnam War are inscribed on the pillars. The names of those who served in peace time and the Gulf Confilict have also been added. 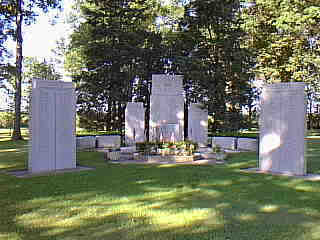 The memorial was originally the dream of Rev. Gerald Johnson, pastor of the Salem and Zion Presbyterian Churches at the end of World War II. As Johnson's vision began to take root, the committee who would plan the park and the trustees who would maintain the facility were appointed by the trustees of Salem Presbyterian Church. The first order of business was to seek a place for the memorial. A four-acre plot between the old and new cemeteries was targeted. On May 3, 1945, David Evans signed a deed conveying the property to Joseph Williams, Robert Morris, and Lloyd Reese, trustees of the memorial. The initial letter that went out announcing the idea of the memorial stated that, "here in Venedocia we are eagerly looking forward to the return of more than 50 young men who have served their country long and valiantly. Many of us have felt for some time that some sort of a memorial to the vetrans ought to be provided to our community." In addition to the ornate beauty of the configuration, it was the hope of those early founders that the site could also be used for community services such as memorial Day activities and Easter sunrise services. Becuase of the community's dedication to musical tradition, it was also hoped that the setting might provide a tranquil environment for community vespers services. On Oct 20, 1946, residents flocked to the site for a cornerstone laying. Contents included in the stone were a letter from Rev. Johnson, a letter announcing fundraising plans and various other papers of the time. The memorial was eventually dedicated on May 30, 1947. In the early 1980's park trustees pushed for a project to increase the tree population of the park. Some of the older trees were in such bad shape that it was necessary to remove them and replace them with younger stock. The wind sings through the old trees providing shade to the memorials of Venedocia past. One can't help but imagine that the analogy of the replacement trees symbolizes the effort of community leaders to provide an eternal tribute for future "replacement generations" to remember the strength of a community that wishes to honor its dead heroes.